Engr. Nasiru Muhammed Gungura is an experienced, astute professional and a holder of Aircraft Maintenance Engineer’s License (A&P), a graduate of Mechanical Engineering from Ahmadu Bello University Zaria, holder of NCAT Diploma in Aircraft Airframe and Power plant Maintenance Engineering and numerous International qualifications, including the NDT and ICAO TIC 1&2. So far in his Twenty-one years of Aviation experience, Engr. 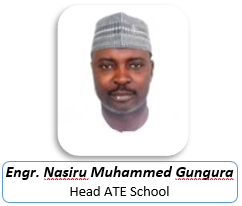 Nasiru M. Gungura has served in several capacities, including Head of Airframe Department, Head of Aviation Management School and presently Head of Aircraft Maintenance Engineering School. He is also one of the Chief Aircraft Maintenance Engineering Licensed Instructors. In conclusion, Engr. Nasiru M. Gungura is a member of several associations such as Nigerian Society of Engineers, National Association of Aircraft Pilots and Engineers, Nigerian Society of Non-­Destructive Testing. AME School was established in 1964, to provide manpower (in the field of aircraft maintenance) for the Aviation Industry, at affordable cost, driving growth and development. To train and prepare manpower capable of providing professionally excellent aircraft maintenance services, second to non in Africa and beyond, contributing to the growth and development of Aviation. To equip Aircraft Maintenance Engineers with the strongest foundational training, guaranteeing the skills, knowledge and attitude needed to excel in their respective careers.